Liberty Mutual’s new $300 million tower opens to employees July 11. 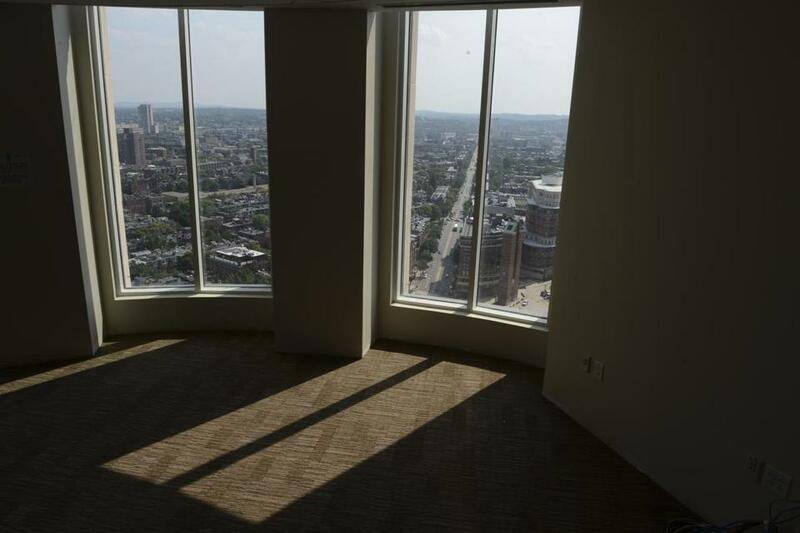 On the 22d floor, the views from Liberty Mutual Insurance Co.’s new office tower in the Back Bay cut in every direction. There are stunning scenes of the Charles River and Boston Harbor, and an equally mesmerizing glimpse of Columbus Avenue as it slices through the South End. It is a compelling perch from which to view a growing city. Liberty Mutual is a company recently criticized for showering its executives with extravagant pay and perks, but its tower is hardly bedecked with gold-rimmed opulence. A tour of the nearly finished high-rise on Tuesday showcased a modern interior with generous amounts of travertine and cherry paneling, but some of the most notable features are ones the public can appreciate, such as a new park on St. James Avenue with a granite waterfall and a series of 16-foot landscaped walls. The $300 million tower was built with millions in public aid, including investment tax credits potentially worth $22.5 million from the state and $24 million in property tax breaks from the city. Those subsidies came as Liberty Mutual revealed it had paid its former chief executive, Edmund F. “Ted” Kelly, $50 million a year, making him among the most highly paid corporate bosses in the country. Kelly’s compensation irked watchdog groups and policyholders because Liberty Mutual is mutually owned, a structure under which surplus profits are typically distributed to customers as dividends or invested in the company. Kelly, who led a threefold revenue increase at Liberty Mutual, is leaving this year after two decades. His successor, David Long, will serve as both chairman and chief executive. Liberty Mutual emphasized that the tower’s construction created 500 jobs and will generate $70 million in real estate taxes for the city over the next 20 years. The company employs 4,900 people in Massachusetts, including more than 3,100 in Boston. “We are excited to celebrate our growth and investment in the economic future of the city we have been proud to call home for more than 100 years,” Long said in a statement. Long was paid about $8.9 million in 2012. The limestone-clad building, designed by CBT Architects of Boston, will open to employees July 11. Situated at the corner of Berkeley Street and Columbus Avenue, it will bring new life to a once nondescript intersection of the Back Bay and the South End. A publicly accessible cafe on Columbus Avenue will have a small amount of outdoor seating. And in coming weeks, contractors will install indoor and outdoor sculptures that will be lighted at night. There is also a new glass footbridge over Stuart Street, connecting the new tower to an older structure, that is backlit at night. Murphy said the footbridge is one of the executives’ favorite new elements — even though during planning it drew criticism as something that would take foot traffic off the street below. Along St. James, the company has added a 10,000-square-foot landscaped public park with benches and the multitiered granite waterfall, which can pour water at multiple speeds.